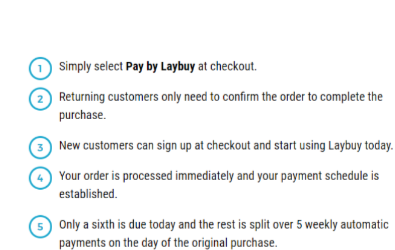 Just continue to checkout and select Laybuy as your payment option, you will then be directed to the Laybuy website or visit laybuy.com/consumer to create your account. 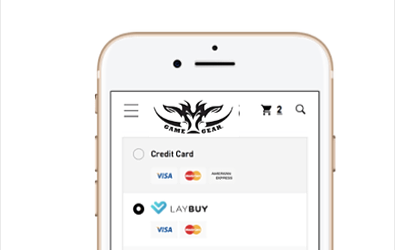 Your limit is assigned through Laybuy’s instant credit check upon sign up. If you don't have a credit score, Laybuy will assign you with $120. No extra information about you is required! You can also spend more than your assigned limit, the extra over your limit will be added to your first payment. WHEN WILL I MAKE MY FIRST PAMENT? Your first payment is made at the time of purchase for one sixth of the total purchase price. We can view your entire payment plan before you complete your purchase so you can see what you owe. If you do not meet your payment schedule, Laybuy will charge a late fee of $10 and additional charges may apply if you continue to miss payments . Give us a call if you have more questions or if you need some help with your order.